For most people waiting hours to get a glimpse of royalty is more than worth it. 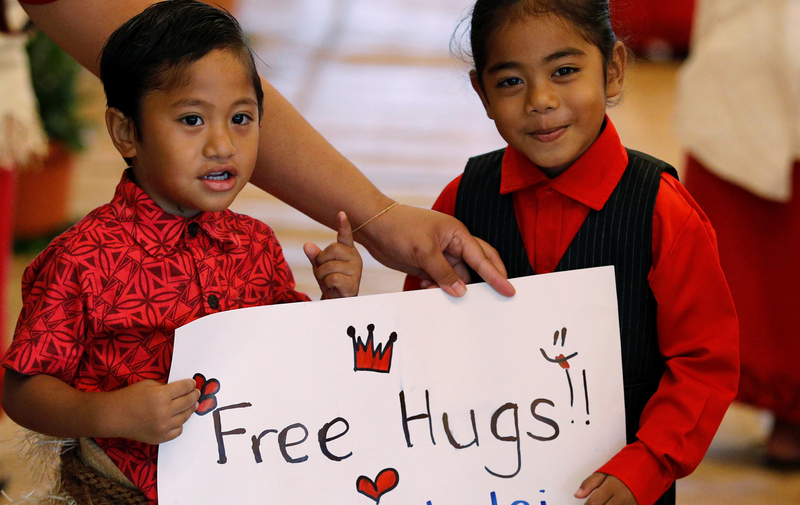 But an impending visit from Meghan Markle and Prince Harry wasn’t enough of an incentive for one little boy on the South Pacific nation of Tonga to keep his eyes firmly prized open. 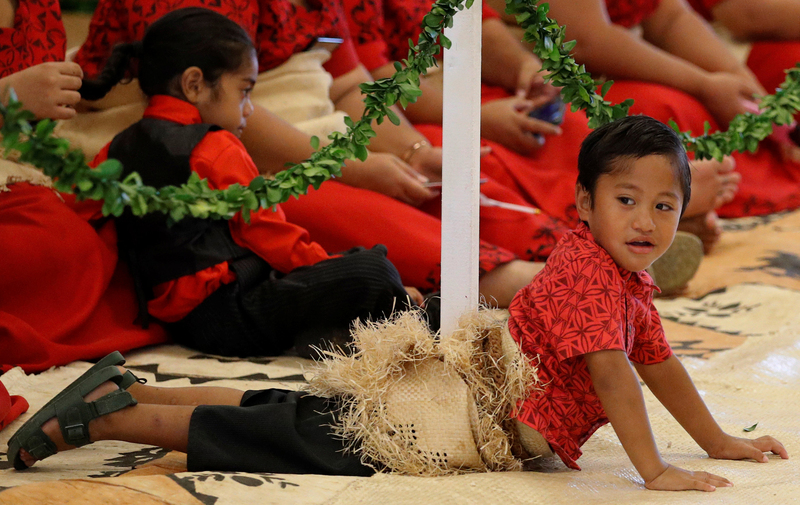 The seemingly bored youngster took a ‘nap’ in full view as he waited for the Duke and Duchess of Sussex to meet Tonga’s Prime Minister Akilisi Pohiva at the Fa’onelua Convention Centre. Laying face down on the ground the boy soon ‘woke up’, just in time for their arrival – and was spotted by dad-to-be Harry. According to Nine.com.au the boy had initially held up a sweet sign offering ‘free hugs’ to Meghan and Harry before he began ‘fooling about on the floor before playing dead’. But rather than give him a disapproving look for his antics on the floor the laid-back prince soon joined in on the fun and even ended up giving the youngster a hug. Watching the adorable scene between the pair unfold Meghan – who is expecting her first child with husband Harry – was seen with a delighted look on her face. During the eventful visit the royal couple were presented with traditional Tongan Kiekie (dress) at a handicraft market and were entertained by dancers in traditional woven skirts and necklaces. 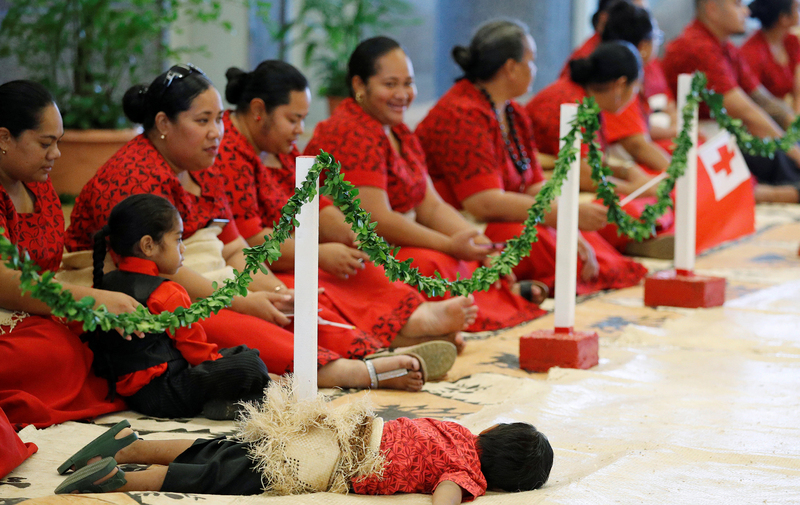 The royals also sat on throne-like chairs, speaking to Princess Angelika Lātūfuipeka. She described Harry and Meghan as ‘an inspiration to the youth of the Commonwealth’ for ‘shining a light on youth empowerment’. Meghan and Harry are on a 16-day royal of Australia, New Zealand, Tonga, and Fiji – and fans recently spotted a detail on one of Meghan’s tour outfits that could give an insight into her due date. The couple are set to return to Australia tonight for the final days of the Invictus Games – the competitive sporting event for wounded, injured or sick armed services personnel and their associated veterans which Harry founded in 2014.